ECHO BAY, Ont. – Trent Massey was a farmer raising cows, chickens, pigs and goats in Echo Bay, Ont. But when he had to pack the business in and sell his livestock, he and his wife were left wondering what to do with their sprawling 30 acres of land. When Massey was introduced to Forests Ontario’s 50 Million Tree Program (50MTP), things fell into place. 50MTP, a province-wide program, provides funding support and technical assistance to landowners wishing to plant trees. White spruce, Jack pine, White cedar, Norway spruce, and Poplar were all planted – an impressive total of 5,500 trees in all. 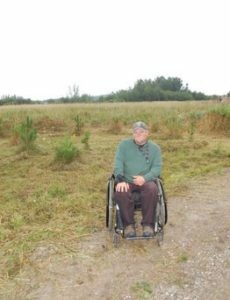 This mix of species will serve several purposes on Trent’s land; from creating a windbreak around the perimeter of the property, providing privacy and creating habitat for wildlife. Massey’s relationship with Atwell, and his keen interest in forestry, landed him a job with REGEN Forestry. He is now the resource manager with the organization, a role he enthusiastically enjoys. Massey is recognized as a Green Leader, an award which recognizes individuals for their commitment to tree planting and land stewardship. Just curious, what did he do with the rest of the acreage? When I was planting a lot of trees, we planted roughly 800 trees per acre, thus pushing the trees up and helping in self pruning. I know the goal was for wildlife, wind shelter, and control noise, plus privacy. However, as a future investment, why not some higher-value trees mixed in, such as maple, cherry, black walnut, red and white oak. Perhaps out of the black walnut zone, perhaps even too heavy or low for the oaks!!! Just interested.